A review of the literature suggests that evidence for vitamin C’s role in anxiety reduction is largely anecdotal. In other words, lots of people who have tried it said that it worked for them, but there are no controlled studies directly testing its effects on anxiety. However, there are studies indicating that vitamin C may improve resilience to stress. Vitamin C is critical to the synthesis of norepinephrine, a mood-regulating neurotransmitter. It is also a potent antioxidant, helping to protect the body against disease (Higdon & Drake, 2009). The American Chemical Society (1999) found that vitamin C reduces body indicators of stress, such as stress hormone levels, adrenal gland enlargement, and thymus gland reduction. Although the study used animals, the researchers note that humans and animals have similar stress responses, including the release of corticoids by the adrenal glands (which can trigger a fight-or-flight response, and therefore a panic attack), as well as immune system suppression. Other researchers have also found that vitamin C reduces physical and psychological stress in people. For example, Brody et al. (2002) found that vitamin C supplementation reduced physical signs of stress (cortisol levels, blood pressure) and psychological feelings of stress in human subjects engaging in stressful activities such as public speaking and doing difficult mental arithmetic. Also, Mazloom et al. (2013) found that vitamin C supplements decreased anxiety in diabetic patients and Wang et al. (2013) found that supplementing with vitamin C enhanced mood and reduced psychological distress among elderly patients in acute care hospitals (though many of these individuals suffered from vitamin deficiencies at the start of the study). In addition, evidence from other human studies indicates that vitamin C can help to support adrenal function and normalize cortisol levels (Head & Kelly, 2009). Chronic stress may reduce levels of vitamin C, and a vitamin C deficit may reduce immune function, causing further stress. According to Robert Jacob, PhD, most people don’t eat enough fruits and vegetables, so they fall far short of the amount of vitamin C they should consume each day (cited by the Washington University in St. Louis School of Medicine, 2011). Vitamin C levels can also be depleted in those who use aspirin frequently or take birth control pills (Higdon & Drake, 2009). Recommended daily intakes for vitamin C vary widely. The U.S. government’s National Academy of Sciences recommends a minimum of 75 mg for women and 90 mg for men, whereas the Linus Pauling Institute recommends at least 400 mg, which can be obtained by consuming at least 10 servings of fruits and vegetables daily or via a combination of fresh produce and supplements. Vitamin C at recommended doses is safe for most people. However, some experts believe that large doses can interact with medications such as warfarin (Coumadin), so it’s a good idea to check with a doctor before supplementing, particularly if you take blood thinning medication (Higdon & Drake, 2009). See the Vitamin C information page for vitamin C recommendations and natural sources, and Does Vitamin C Prevent or Cure Colds? 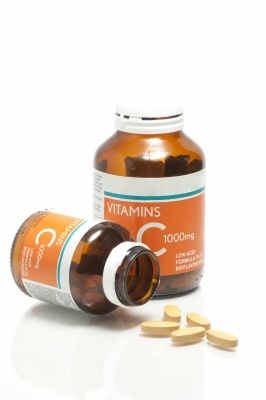 for information on vitamin C and illness studies. American Chemical Society (1999, August 23). “Scientists Say Vitamin C May Alleviate the Body’s Response To Stress.” ScienceDaily.com. Bourne, E.J., PhD. (2005). The Anxiety and Phobia Workbook. Oakland, CA: New Harbinger Publications. Brody, S.; Preut, R.; Schommer, K.; & Schürmeyer, T.H. (2002). “A Randomized Controlled Trial of High Dose Ascorbic Acid for Reduction of Blood Pressure, Cortisol, and Subjective Responses to Psychological Stress.” Psychopharmacology (Berlin), 159(3), 319-324. Higdon, J., PhD (Original Writer), & Angelo, G., PhD (Updater, 2013). (Reviewed 2013, November, by B. Frei, PhD, and Michels, A. J., PhD). “Micronutrient Information Center: Vitamin C.” Linus Pauling Institute, LPI.OregonState.edu. Mazloom, Z.; Ekramzadeh, M.; & Hejazi, N. (2013). “Efficacy of Supplementary Vitamins C and E on Anxiety, Depression and Stress in Type 2 Diabetic Patients: A Randomized, Single-Blind, Placebo-Controlled Trial.” Pakistan Journal of Biological Sciences, 16(22), 1597-600. Wang, Y.; Liu, X. J.; Robitaille, L.; Eintracht, S.; MacNamara, E.; Hoffer, L. J. (2013). “Effects of Vitamin C and Vitamin D Administration on Mood and Distress in Acutely Hospitalized Patients.“ American Journal of Clinical Nutrition, 98(3), 705-11.Washington University in St. Louis School of Medicine. (2011). “Stress, Nutrition, and Immunity.” Being Well, Winter 2011. MedSchoolHR.WUSTL.edu. Washington University in St. Louis School of Medicine. (2011). “Stress, Nutrition, and Immunity.” Being Well, Winter 2011. MedSchoolHR.WUSTL.edu.